Lichtenstein, Man with Coat (1961) Pochoir, brush, pen and ink on paper. The Sonnabend Collection. ....and by Rembrandt and Caravaggio too. At top the young Dutchman's Self-portrait with a Dead Bittern depicts the artist showing us an example of his painting, the Dead Bittern. His extended arm is a pose all painters are physically familiar with. Many then will see it as that of a painter stretching towards a canvas. In the lower image Carvaggio does likewise.The young warrior David, a common alter ego in earlier centuries, shows us the artist's own self-portrait in a similar fashion. 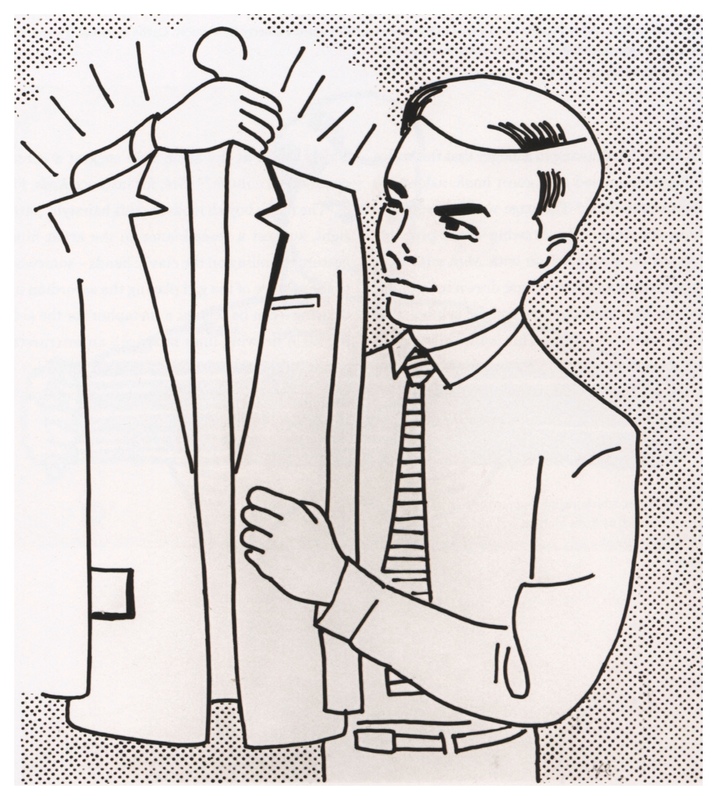 Although Lichtenstein's man holds up the coat with one arm extended, he touches it with the other. That gentle gesture has meaning as well. 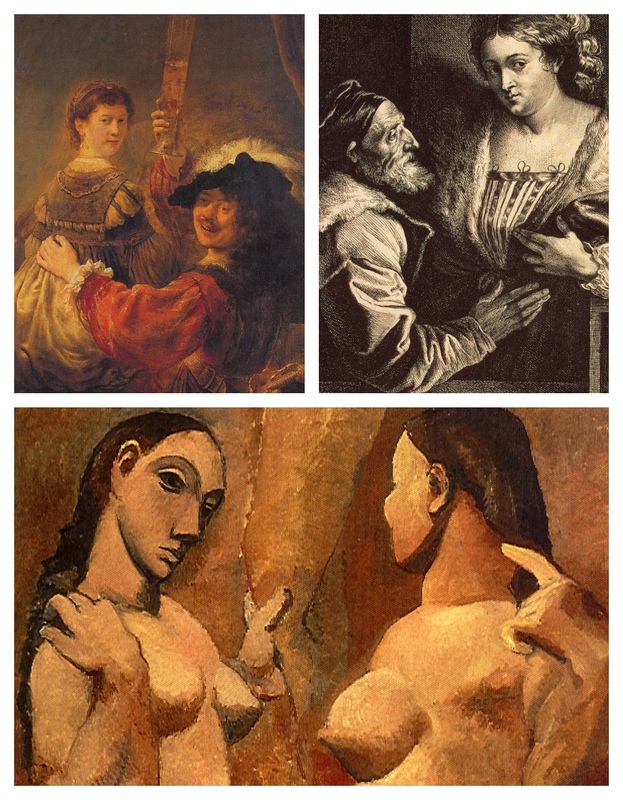 As explained in entries on Rembrandt's Self-portrait with Saskia and Van Dyck's Titian with His Mistress (both, top) an open hand touches a figure and thereby paints it. Both hands in Picasso's Two Nudes (bottom) paint the nudes painting themselves though the one on the left is the type used by Lichtenstein. Lichtenstein's man must therefore be the "artist"; his coat is his "painting". He may even have recalled how paint can be applied "in coats".1 The wire hook, resembling a halo, when combined with the lines of radiance from the coat, suggest the artist's divinity and purity of mind, the result of Lichtenstein's clever use of a 1950's advertising symbol for cleanliness: radiating lines, which are themselves a draughtsman's stock-in-trade. That is not all. I suspect that the lapels form Lichtenstein's initial "L" (top), not just on left and right as in the two sides of the brain, but above and below as well (across the dotted line) as if Narcissus were looking at his reflection in a pool. Indeed the dividing line between the L and its reflection goes straight to the man's eye. Narcissus, of course, was the legendary inventor of painting because painters paint themselves.2 There are potential L-forms in the pockets too (indicated in diagram below) while the concise belt buckle is both phallic and shaped like a paintbrush. 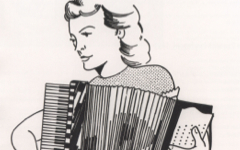 Lichtenstein, as early drawings like this show, was both a man of his time and of art. He thought profoundly and conveyed it behind the modern disguise of casual appearances. 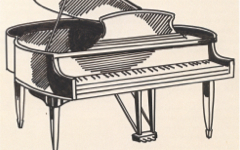 Top and Bottom: Two diagrams of Lichtenstein's Man with a Coat, one identifies the L's in the lapels reflected (top), the other additional L-shapes and phallic-brush-shape in belt buckle (bottom). A 20th-century version of medieval angels playing stringed instruments. See how. 2. According to the Renaissance art theorist, L.B. Alberti, in his treatise On Painting. Original Publication Date on EPPH: 08 Mar 2013. © Simon Abrahams. Articles on this site are the copyright of Simon Abrahams. To use copyrighted material in print or other media for purposes beyond 'fair use', you must obtain permission from the copyright owner. Websites may link to this page without permission (please do) but may not reproduce the material on their own site without crediting Simon Abrahams and EPPH.